-Special design with different functions. You can use it in your office or at home. 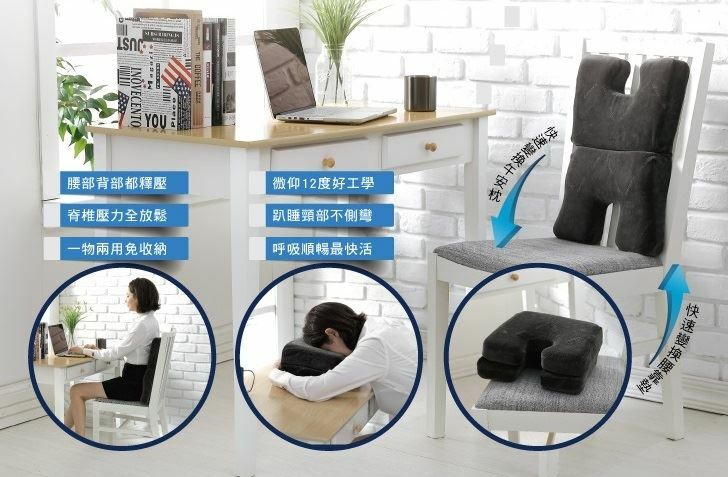 -You can use it as a midday sleep pillow by put your head on it very comfortable, because our special design to fit people head shape. And also you do not need to use your arms to hold your head, so you will not feel uncomfortable after your midday sleep. -It can also stand up, and you can lie your back on it to protect your spine when you work in office. (2) You can use it as a midday sleep pillow by put your head on it very comfortable, because our special design to fit people head shape. And also you do not need to use your arms to hold your head, so you will not feel uncomfortable after your midday sleep. (3) It can provide the correct way for holding your spine by using MDI environmental protection foam. (4) One pet with two ways to use, which will decrease the space to collect it. It can provide the correct way for holding your spine by using MDI environmental protection foam.